A Humboldt penguin chick born Feb. 12 at Brookfield Zoo is healthy and being hand-reared by animal care staff, the zoo said this week. The yet-to-be-named chick is being monitored closely and weighed three times a day: once each morning to determine how much weight he gained over the previous 24 hours, as well as after each feeding to measure how much food (herring and marine smelt) he consumed. In early April, about two months after birth, the chick will shed his down feathers, at which point he will be introduced to a shallow pool of water. The penguin’s adult plumage will not develop until he is about 2 years old. The chick will soon be introduced to his new home in the Humboldt penguin colony habitat in the zoo’s “Living Coast” exhibit. 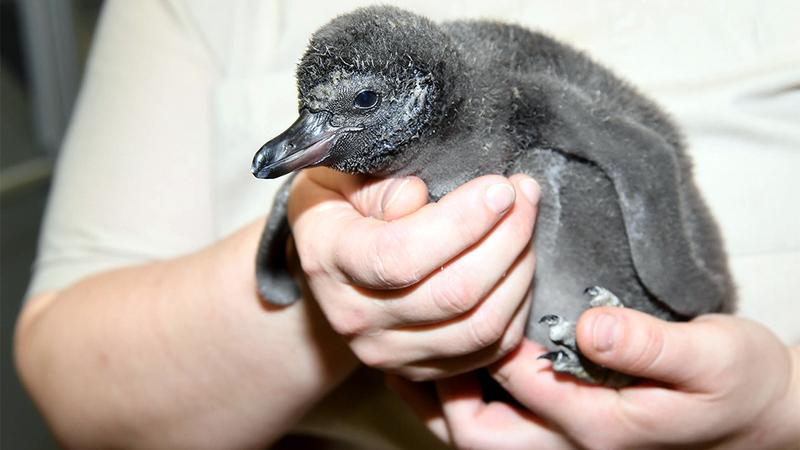 As early as May, the chick could begin serving as an ambassador for the zoo’s Penguin Encounters, during which visitors learn about penguins while getting a closer-than-usual look at the waddling animals. July 24: For the first time, Lincoln Park Zoo is offering visitors a chance to get up close and personal with their African penguins. We meet three waddling, webbed-feet bachelors. July 17: Lincoln Park Zoo recently launched a web series to chronicle the latest crushes, power struggles and other dramatic twists and turns surrounding the lives of its 15 African penguins. Feb. 20, 2017: For the fifth year, members of Shedd Aquarium's Animal Response Team participated in a rescue mission of endangered penguin chicks in South Africa. Learn about their work.